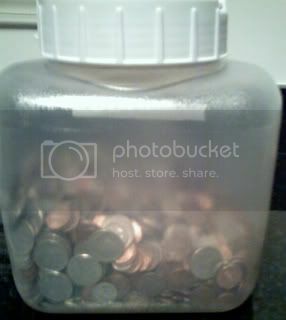 Very confused store people watched as a dumped a huge plastic bottle of years of spare change in their Coinstar machine Saturday morning. Actually, it took me three tries to get this to work, because I tried to go late at night a week ago only to find the machines shut down. Since you’ve got to go to Customer Service to redeem your receipt (if you’re not smart enough just to take a gift card and save yourself the counting fee), they must shut the machines down when there’s no one on duty. By the third time, I smarted up and grabbed a cart to wheel my jar around. BTW, Cubs posts catch up start on Thursday or Friday.